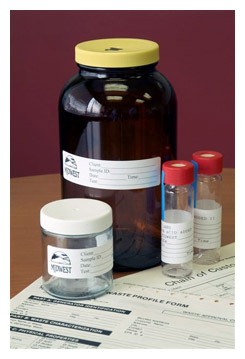 A waste profile form and representative sample must be submitted for each waste stream along with any support data such as a Material Safety Data Sheet or current analysis. Sample is logged into our computer system and assigned a tracking number. Quality control analysis is performed on each sample. Once analytical analysis is completed, the results are compared to the profile form to ensure its accuracy. The waste profile form is then given to the technical manager for final approval. Once the profile review and analysis are completed, the most efficient and cost effective treatment method is determined for your waste stream. A copy of the waste profile form and a quotation is then returned to you along with the Waste Approval Number for your waste stream. Upon your approval, the waste stream can be scheduled for pickup and disposal. CLICK TO DOWNLOAD A WASTE PROFILE FORM.